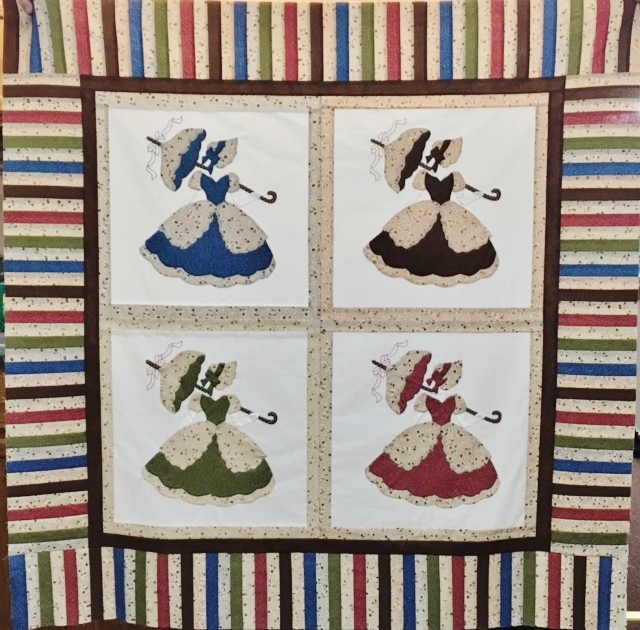 The Ladies Quilt is Completed! Greetings from lovely Hotsville, Texas. I am getting somewhat used to it as long as I do not have to go anywhere after 11 AM. (LOL). I have finally finished Wanda’s Ladies quilt. It is an older pattern but one that was fun to applique. I used fabrics from the Connecting Threads Charleston collection about 2 years ago – maybe a little longer. I am very pleased as to how it turned out. I love the piano keys border. The fabrics are coordinating and rather than just sewing the ladies together, I put a corresponding fabric around each block that matched the dresses and umbrellas. Of course the piano keys are made from the same for coordinating fabrics. The ribbons on the top of the umbrellas are embroidered. Now on to putting the Threads of Memory (think that was a 2014 project by Barbara Brackman). I have not had a “vision” of how to set the blocks, so it will take me a few days to think it over. I really feels good to finally finish a project, albeit a small quilt. Have a great evening and sewing day tomorrow. This entry was posted in Uncategorized and tagged Antibellium Ladies, Barbara Brackman, Threads of Memory. Bookmark the permalink. The piano key border….perfect. I like how you used the colors from the ladies’ dresses. Thank you Karen. I am from the days when things were “matched”. I am working on doing scrappy with my Circa 2016. Have a great evening. That is so pretty! I love the border, too. Thx Jeanne, think Wanda will like it too.